A sworn statement is a declaration given under oath that the facts contained in the statement are true and accurate. Sworn statements carry the same weight as testimony given on the witness stand; therefore, the statements can be introduced into evidence in a court of law. Sworn statements are also used by state and federal agencies when certain facts about a file must be verified as true. Many courts and agencies have forms for sworn statements that must be completed by the person giving the declaration. Get the appropriate form for the sworn statement. Request the form from the agency or court. 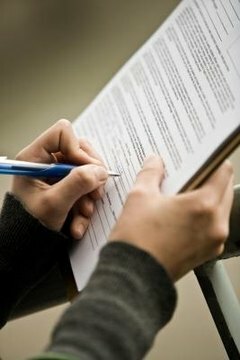 Fill in the form with your first and last name in the paragraph indicating that you are giving the declaration under oath. This is usually the first paragraph of the sworn statement. Write the important facts that you swear to be true. Write them like a list with numbers and full sentences. For example, if you are swearing that you were born a certain date and you have a child, you would write: "1. I was born January, 1, 1981. 2. I have one son, born January 5, 2010." Sign the sworn statement in the presence of a notary. The signature line is usually accompanied by a sentence indicating that the facts therein are true. Ensure that the notary affixes a stamp and signs the sworn statement. Longren, Trudie. "How to Complete a Sworn Statement." , https://legalbeagle.com/8377515-complete-sworn-statement.html. Accessed 24 April 2019.